A number of recently introduced under-deck ceiling systems use corrugated aluminum or plastic panels designed to catch water that drains through decking and channel it away from the area below. AR rain tight panels are made of heavy-gauge aluminum. 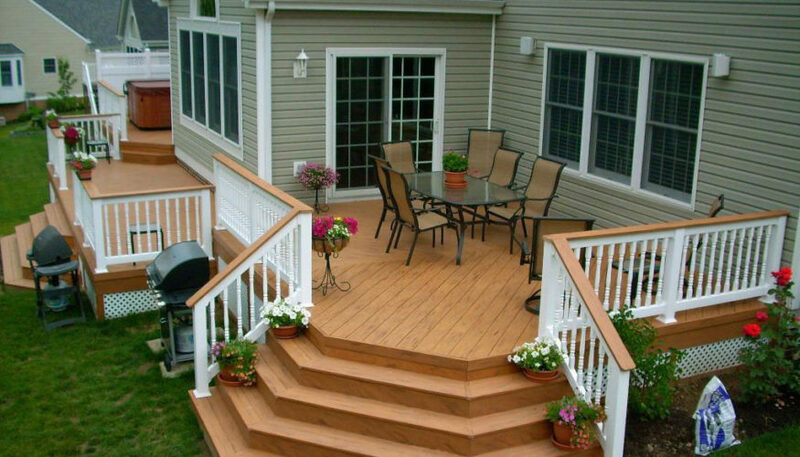 The seamless panels are custom-fabricated, based on the size of the deck. They lock together along their long edges to form leak-proof joints. AR rain tight panels, made of aluminum, lock together to create waterproof joints.A perimeter frame and graduated spacer-nailers are fastened beneath the deck joists so that the plane of the ceiling slopes slightly (at least 1/4 inch per foot) away from the house toward the joist header. A system-compatible aluminum trough is fastened below the joist header to carry runoff to one or more downspouts that drain to the ground outside the protected area. Simpler than membrane and ceiling systems, waterproof decking flanges offer an effective means of diverting water that would otherwise drain through conventionally spaced deck boards. AR flanges are designed to act as spacers between boards and also as mini-gutters to channel water toward deck edges. The rubber flanges are pounded into decking edges with a rubber mallet. AR flanges are available in a number of sizes that match the edge grooves found on major synthetic decking brands. The edges of wood decking boards can be milled with a dado blade, shaper or router to accommodate the flanges.